Presbyopia is one of the first changes that results from the crystalline lens losing its flexibility. Presbyopia begins at around age 40 and progresses until about age 65. Until approximately the age of 40, the crystalline lens is both “crystal clear” and quite soft and flexible. This flexibility permits the crystalline lens to change its shape and alter its curvature so that it can help focus your vision at various distances-from far, to near, to arms length, to far or near again. This flexibility gives you the ability to see things at all distances. Around the time we enter our 40’s, the crystalline lens begins to stiffen. The stiffening of the crystalline lens makes it progressively more difficult to change focus and thus to see clearly at all distances. Usually this reduces our ability to see objects clearly at arms length or close objects, or reading material. When this loss of flexibility occurs, it is called Presbyopia or “old eyes”. Presbyopia is a normal and expected consequence of growing older and it affects everyone. As the crystalline lens loses its ability to flex and change shape, it is no longer able to bend light rays. 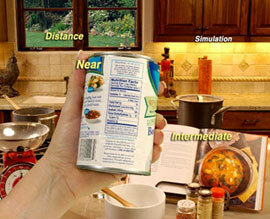 This results in a gradual and progressive loss of your ability to focus on near objects. Patients who experience the start of Presbyopia will most often observe, that their “arms are too short” requiring them to see up close by moving near objects and reading material farther away in order to bring them into focus and see them clearly. It is important to note that Presbyopia affects everyone including those who have cataracts. When Presbyopia begins people who have never worn eyeglasses find that they need reading glasses or bifocals in order to read and see up close. People who already wear glasses may need bifocals or trifocals in order to see comfortably up close. There have been many advances in cataract surgery and lens implant surgery techniques. Today, patients can elect to have presbyopia correcting multifocal lens implants so that lens replacement surgery can often help patients achieve clear distance vision as well restore their normal range of vision without being dependent on eyeglasses, bifocals or reading glasses. A Monofocal Lens Implant is the most basic type of Lens Implant used to correct vision after Cataract Surgery. For approximately the first thirty years of Lens Implant Surgery, all Lens Implants were of a type called a Monofocal Lens Implant. A Monofocal Lens Implant can provide very good vision after Cataract Surgery-but only at one set distance-usually for seeing things at a distance such as for driving or going to the movies. A Monofocal Lens Implant does not correct intermediate or arms length vision for doing things like playing cards and seeing the golf ball on the tee, or even seeing computer screens clearly. Nor do Monofocal Lens Implants correct near vision for doing things up close like seeing medicine bottles, reading or keeping your golf score, as these tasks require the correction of Presbyopia. Thus patients electing to have Monofocal Lens Implants will be dependent on glasses either some or most of the time in about 70% of cases. An Aspheric Lens Implant is a type of Lens Implant that is specifically designed to reduce the visual disturbances caused by the optical aberrations found in ordinary Lens Implants. This reduces the tendency to see “glare” that you might experience with basic Lens Implants and thus can offer improved sharpness and contrast, helping patients in certain lighting conditions. Aspheric Lens Implants only correct distance or far vision, such as that required for driving. 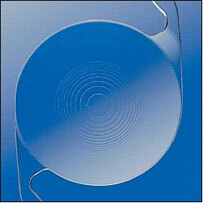 Aspheric Lens Implants do not usually correct intermediate or “arms length” vision, such as that required for viewing computer screens, and do not correct near vision as required for reading. Patients who wish to have the best quality of distance vision may wish to consider an Aspheric Lens Implant, but need to remember that it will still be necessary to wear reading glasses or bifocals to correct their intermediate and near vision. Aspheric Lens Implants usually cost slightly more than a basic lens implant and it is possible that your insurance will not completely cover the cost of the Aspheric Lens Implant. If you are particularly demanding and want the best possible distance vision after your Cataract Surgery, you will be able to discuss this option with your Cataract Surgeon and Lens Counselors during your Cataract Consultation. Your Cataract Surgeon will be able to explain all of the possible benefits and the Lens Counselor will be able to explain any additional costs and arrange payment if necessary. Toric Lens Implants are a type of Lens Implant that can correct astigmatism. Astigmatism is an optical aberration that is caused by the cornea being shaped more like a football, than a sphere like a basketball. For Cataract patients who have astigmatism, and who do not wish to wear eyeglasses to see clearly at a distance, choosing a Toric Lens Implant can help them be independent of glasses for tasks such as driving, that require clear distance vision. 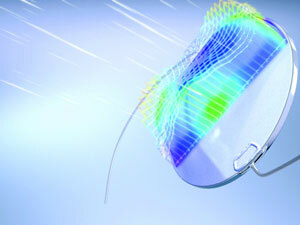 Toric Lens Implants do not correct Presbyopia, and thus even with Toric Lens Implants to correct astigmatism after Cataract Surgery, most patients still require reading glasses or bifocals to be able to comfortably perform near vision tasks such as reading and intermediate vision tasks such as computer work. Near Vision Presbyopia Correcting Lens Implants can often provide excellent vision after Cataract Surgery at both distance and near. Depending on your specific vision requirements, there are several types of presbyopia correcting multifocal lens implants the Eye Consultants of Pennsylvania Cataract Surgeons might suggest, including the ReSTOR® Lens Implant, the Crystalens® Lens Implant or the ReZoom(TM) Lens Implant. Each of these lens implants or Intraocular Lenses (IOL) works in a different way to help you achieve your vision correction goals of being able to see at a variety of distances after cataract surgery- with less dependence on eyeglasses or reading glasses. Presbyopia correcting multifocal lens implants can correct both your distance vision and your presbyopia after cataract surgery. For the vast majority of patients, having a multifocal lens implant means that you will be able to see at distance and up close without being completely dependent on eyeglasses. So, patients choosing to have a presbyopia correcting multifocal lens implant will likely find that they can drive, watch television, play golf and keep score, read a menu, play cards or do crafts-without the need for glasses. Patients choosing multifocal lens implants typically experience a greater overall freedom from glasses allowing them to participate in most everyday activities without dependence on, or the hassle and expense of glasses. As with any surgical procedure, there are always risks as well as benefits. During your eye examination and cataract consultation, we will perform a cataract examination and then arrange your cataract surgery scheduling. In addition, we will the spend the time necessary to review the everyday activities that are most important to you-and whether being independent of glasses for those activities is something that you would like to achieve. As you prepare for your visit to Eye Consultants of Pennsylvania for your examination it will be helpful if you begin thinking about what those activities are so that you can discuss them and explore them with the staff. If you decide to have a presbyopia correcting multifocal lens implant, our staff will make sure to review your questions and fully explain any additional fees related to the multifocal lens implant that you might be responsible for. Medicare and most insurance covers the cost of the cataract surgery, the surgical facility fee for cataract surgery, the surgical fee for cataract surgery-but not the cost of the presbyopia correcting multifocal lens and its implantation. In most cases, Medicare or the insurance provider asks Eye Consultants to bill you for the additional cost of the necessary testing, the multifocal lens itself and its implantation. Our staff will be pleased to review any costs as well arrange easy affordable monthly payments to fit your budget, should you decide that the multifocal lens is the best choice. You can see the optical zones of these lenses in concentric circles and this is the optical physics that permit the multi-focusing power of these lenses.